Crisps! I love crisps. These are a new pesto & mozzarella flavour, I haven’t got around to trying them yet but I think I’m going to tonight. The crackers I’m going to try some sprinkled over a potato & bacon casserole like Jessi suggested, and then the rest I will snack on! I had the hazelnut bar of chocolate last night – yum! I’m looking forward to snacking on the chocolate & cranberry flakes, though I can imagine once I open them I might want to eat the whole pack!… The butter vanilla flavouring I think I’m going to use for little man’s birthday cupcakes. 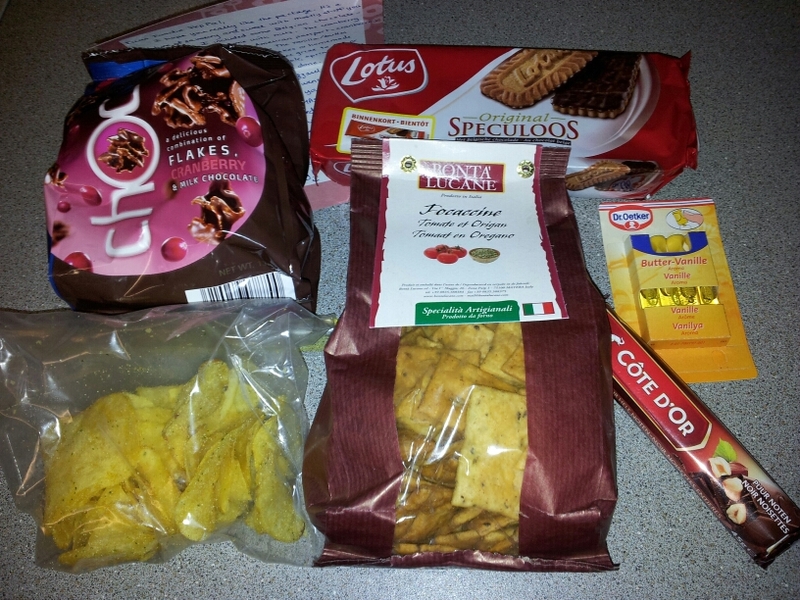 And the speculoos biscuits, I’m resisting opening them because I want to try some of the recipes on Jessi’s blog! Once again another awesome parcel, I can’t wait to see what next month brings!